Drivers, like any other form of software, have an architecture, either 32 bit (x86) or 64 bit (x64). When trying to load drivers in WinPE, it is essential to have drivers which match the architecture of your WinPE environment. For example, using 32 bit drivers on a 64 bit WinPE could cause load failures. Normally, when booting from a RAID controller, be it array or single drive configuration, drivers will need to be loaded in order to access that device. However, as the device will not be visible to WinPE you cannot put drivers on any disk (fixed or optical) which is connected to that controller. In order to get round this chicken and egg problem, you will need to place drivers for the device onto a disk which is visible in WinPE, a good choice would be a USB pen drive for this (USB2 recommended unless PE4). The exceptions to this are nVidia RAID and Intel Matrix RAID, as WinPE has built in driver support for these devices. Note: The '/e' switch means recursive copy and is not to be confused with the drive letter 'e:'. If 'e:' is present during the boot menu load then the drivers will be loaded. 1. Take the 'Windows PE' rescue CD option in the rescue CD wizard. Just click 'Next' and be patient while the integration completes. 3. Once the integration is finished cancel the rescue media wizard on the final Wizard page. 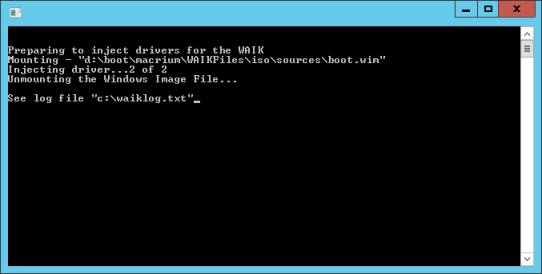 This will automatically inject the drivers into the windows image file (WIM) and will take a few minutes. 5. Once completed, take the rescue media build wizard again, click through to the final page and create your rescue media. Drivers will be integrated and you should have no problems booting with the CD and recognizing your local RAID volumes or USB 3.0 host controllers (PE3.1). Note: If you re-integrate the rescue media WIM by clicking the 'Re-Build' button on the final Wizard page, or if an update to Windows PE is made available then you must follow this procedure again to add drivers into the newly created WIM file. If you still have problems then email the file 'c:\waiklog.txt' and an explanation of your issue to support (at) macrium.com so we can investigate further. Macrium Reflect will load drivers based on the existence of the file macrium.oem, the following locations will be checked in sequence and if the file macrium.oem is found then driver loading will commence from that point. Subsequent locations will not be checked for drivers. Removeable media (such as USB pen drives). The file (macrium.oem) must reside in the Drivers folder on the root of the media. CD=ROM/DVD-ROM drives. The file (macrium.oem) must reside on the Drivers folder on the root of the media. Local fixed hard disks. The file must reside on the Boot\Macrium\Drivers folder on the root of the local hard disk. Please note that in Windows, the drivers folder that's loaded when WinPE boots can be located in c:\Boot\Macrium\Drivers. Once USB/CD-ROM/DVD-ROM rescue is created this folder will be \Drivers on the root of the respective rescue media. On 64 bit WinPE systems, most drivers will require a supporting security catalog and in some instances, DLL files. If running a 64 bit Windows Vista system or later, Macrium Reflect will take care of this for you when building the rescue media. However, if on an XP or 2003 Server operating system you will need to make sure you provide a driver package that contains a security catalog and any supporting DLL files when using the Update Driver feature in the Create Rescue Media wizard.